Are you looking for a fun activity for yourself or your family this fall? Why not spend a few hours crawling around picking acorns or walnuts. Need some seeds to plant? Soon after the beginning of the nurseries in Wisconsin, managers realized they had a special role to play in the development of trees, especially when it came to disease resistance, growth, and form. In conjunction with the UW system, USDA Forest Service scientists and researchers and our own tree geneticist, nursery staff established a number of seed orchards. 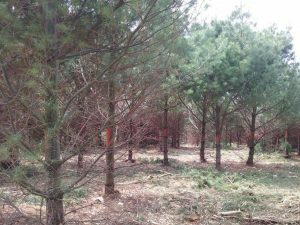 Throughout the decades, we have explored and invested in new sites, creating a tree improvement program that is stocked with species in various stages of development and/or characteristic selection. 2016 was the second season reforestation staff have use the revised protocol for monitoring reforestation sites. Due to ample rainfall and warm weather, the seedlings across the state are performing very well. This fall we are looking at sites that have gone through 3 and 7 years of growth and have visited 25 sites so far. Every spring, the nursery receives an order for Arbor Day seedlings from Greenwood Elementary. Greenwood Elementary students plant a class tree. 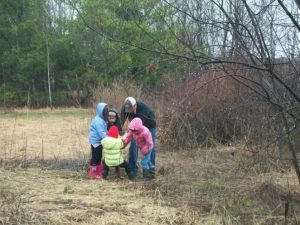 Nothing unusual there since the reforestation program provides more than 35,000 free seedlings to 4th-grade classrooms throughout Wisconsin every spring. What caught our attention about this order is that each year it included an additional request: a single hardwood seedling. We caught up with the local DNR Forester, Chris Schmitz stationed in Neillsville, to ask about this unique outreach project in Clark County. The Division of Forestry created a Natural Regeneration Ad Hoc Team to review and recommend natural regeneration monitoring protocols in an effort to provide a more cohesive statewide strategy for achieving successful natural regeneration. Forest regeneration was identified as an implementation issue in the Division’s Strategic Direction. Forest regeneration monitoring was also identified as an opportunity for improvement in forest certification audits on state lands. During the seedling lifting season each spring, it has been a tradition at the Griffith Nursery to offer inspirational words and thoughts to the staff on a dry erase board in the employee break room. Drawing on witticisms from famous athletes, authors, political figures, and comedians seems to provide a bit of levity during an often stressful time. Find the light. Lean into the wind. Survive. Thrive. Be the jack pine! 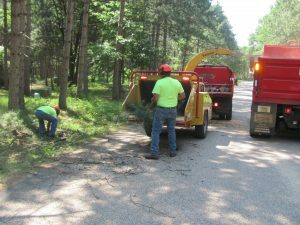 High fire risk communities are eligible to receive grant funds for projects to reduce ‘fuels,’ such as this brush chipping project in Juneau County. Keeping an ecosystem healthy includes management for wildlife habitat, aesthetics, soil and water quality, native biological diversity, recreational opportunities and forest products. One important component of sustainable forestry is the periodic harvesting of trees. In addition to providing forest products, supporting the local economy, and enhancing wildlife habitat, a benefit of timber harvests can also provide protection from wildfire. The spread of wildfire can be minimized by the removal of lower limbs of conifers and small trees near larger conifers reducing chances of a fire climbing into the crowns or tops of existing trees. In addition, the creation of logging roads or “fuel breaks” can slow or stop a fire and allow fire suppression crews easy access for suppression crews easy access for suppression and mop-up. 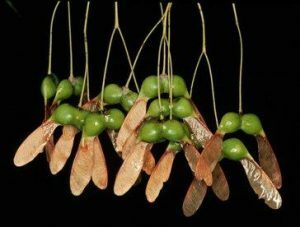 Learn about many other benefits of harvesting trees here.